So, another problem with the world grid. Could be another weak point in the two universes. I think a quick phone call to Brandi might be in order. Does Brandi exist in this universe? Is that the other Daylla stuck in the anchor field? Looks to be. Either that or an echo of her essence. Considering her metallic nature I am guessing it is her and not her essence. I do not expect any real harm to come to either Dayla. “A little guy half your size who can take a harder hit.” Timothy? Not as far to fall either. 1: how are YOU going to fix it? 2: if you are not qualified. WHY IS IT YOUR RESPONSIBILITY? Because The Library never gives you problems you can’t handle. Why does that sound familiar? Because it is biblical…oh, and biblios, the latin root of bible, means library. You’re welcome. Toss a non-conductive line around the trapped Daylla and yank her free? Implication: Daylla occasionally does stuff with maintaining world anchors when we’re not watching. A proud member of the World Grid Maintenance Engineers Junior Auxiliary Corps? Waitaminute — the WGMEJAC? how the heck do you pronounce that — wig me jack? The strength to change the things I can change . . .
And the wisdom to call for backup! haven’t you noticed that where she and this taller Timothy are. There is no one else. I think they have both slipped to an area that’s sort of a safety valve. so the two world don’t ever actually touch. I’m thinking the two world’s touching would be really bad. Him from the other Daylla’s world and her from her world. so there’s one one there to fix this but the two of them. And right now it looks like this guys out for the night. So yes . it’s on her. unless she wants to take up housekeeping between worlds with taller timothy. There’s no one else there because it’s night time, the school is closed, and Dustin isn’t part of a club sleepover. let me clear up what I said before. By saying on one else there I mean they have walked all over the school and not seen any of the sleep over group or digit or Valerie. as in none of that group is where ever these two are. I had the impression that she slipped over into Dustin’s universe, where he’s the only person in the school. 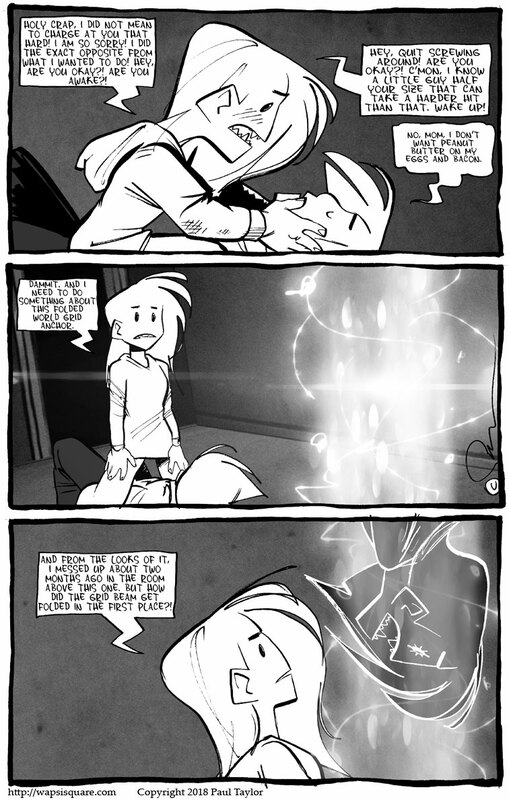 That would explain why it went from him being ghostly and her being solid to the other way around. The sleepover is happening back in Daylla’s original universe. noticed and editing opps. I ment to say there’s no one there not one one there. Whatever it is seems to be linking two different universes. Linking yes, but think of it more like a structural spacer. It’s primary purpose as part of the World Grid is to keep objects and entities from jumping/sliding between dimensions. Don’t you just LOVE Techno-Babble! Maybe the “Anchors” ground whateveris disrupting the Heisenberg Compensators. Ever since Dustin said all that was found was a charred _outline_ of Daylla, I’ve been assuming she wasn’t really dead. While she still could be, this looks more like she’s unconscious and trapped in this grid anchor. It was recently disclosed that teleportation in that universe only works with pepperoni and tomato sauce. So, the dimensional shift you suggest might not be possible. And socks. Any universe, any time, any brand of laundry machines. Welp, there goes whoever’s theory about Dustin’s universe inhabitants being non-paras. Strictly speaking, Daylla didn’t mess up. She refers to “ghostly screaming outline” as “I”, when it should be “she.” They’re two people…aren’t they?